Gilbert Finklestein has stalked and trapped a Natterjack Toad. "Hi Geoff, My Name is Gilbert Finklestein. Worm Breeder. 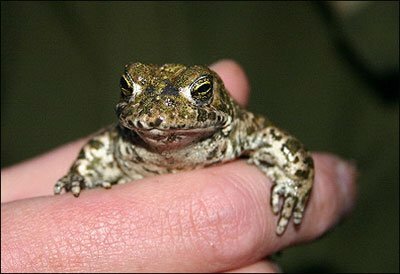 You said nobody had seen the face of a Natterjack Toad. trap and I caught one. Here is a picture of it's face." ever seen the face of a Natterjack Toad, till now. We cannot really argue with him. the database said this position arose. Saying that Black had just played 17...Qb8. that Black played 17...Qd8 so the Knight on d7 does not hang. anyone sees it and uses it in a book of blunders. in database entries. How many more are out there? suspected the move was a typo and suggested it was. is a typo. International players do miss such things." piece hanging so I thought it was OK. It Happens. Recently I gave a game N.Craigmile v M. Wallace. I finished the game on move 19 with 0-1. White has just played 21 Ne3 hitting the Bishop on g4. Black played 21...Ne7? White replied 22 Ne5? I thought. "this cannot be correct. Why not take the Bishop?" mistake had been made in recording the moves. I questioned Mike Wallace about the game a few days later. No. The score sheet was correct. There was a double blunder. Both players missed the fact that the Bishop was hanging. from the Havana Olympiad of 1966. No I was not looking for another Kenny blunder on purpose. I saw the following and skipped through it out of curiosity. This position arose and has few turns well worth knowing. First note that 31...Ra5? is mated in 4 by the x-ray 32 Qa8+. A shot that could easily be missed by both players. What actually happened was Black played 31...Qe7. 35.Rxf8 and Black the exchange down resigned a few moves later. a piece, usually a Rook, on f8 is a fairly common tactical idea. However, the idea may be ancient but it still traps the unwary. 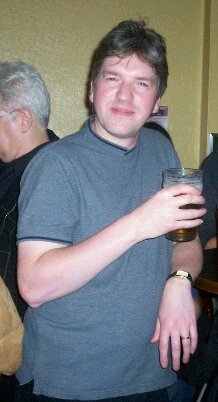 S.Mannion - N.Berry, Hawick, 2005.
stopped, where is his counter play going to come from? You see Neil Berry has a problem here. He is a good chess player. I can demonstrate. Just very difficult to play. Especially against the calibre of Steve Mannion. A weaker player would think Black is doing OK.
"Hey material is even - I must be OK."
and defended with 17...c6. Instead he has an idea. An active idea. This is usually a good plan when your opponent has you bottled up. Suddenly they see you untangling and they panic-sac. So Black sets off on down a path that a weaker player would never have chosen. and protects the backward d-pawn with fxe3. A weaker player would also discard 17...c5 because it losses a pawn. Under normal circumstances Neil's idea, based on the 'loose' Bishop on d3. Would have been OK. He has simply missed the check on h7. this trick because they would not even consider Neil's idea. This is a good players 'bad move.' (does that make sense?). This is the trouble with being a good chess player. finding moves weaker players would never even consider. An under 1600 player can get themselves into difficulties. But to really screw things up you need to be over graded 2000. Black should have stopped and done his check all checks routine. Perhaps then he would have discovered the hole in his idea. Note in Neil's mind's eye the f8 Rook is safe. It's protected twice. Play continued 18...Bxc5? 19.Bh7+ Kh8 20.Qxc5. Queen on c5 smiling at it. Black resigned a few moves later.